Struggling to fill out your tees? Beef up your all three deltoid heads with this twice-weekly routine. Building well-capped shoulders, some would say, takes years and years of heavy pressing and experimentation. Those folks aren’t entirely wrong but it’s not exactly what you want to hear if you’re already behind the curve in this department. By training your delts with a simple, exercise-minimal routine, twice per week, you can start to make up ground on the lifetime pressers pretty quickly. Delts are fast to respond to proper overload and they can handle a reasonable amount of volume. So even if you can’t overhead press 250 pounds for 3-4 reps, you can still reap some appreciable gains from a more conservative press-first approach. If you’re shoulder-light, it’s a good idea to overhead press at the start of the week, while you are fresh. (Note: Yes, we realize this hurts your “bench press Monday meeting…deal with it!) 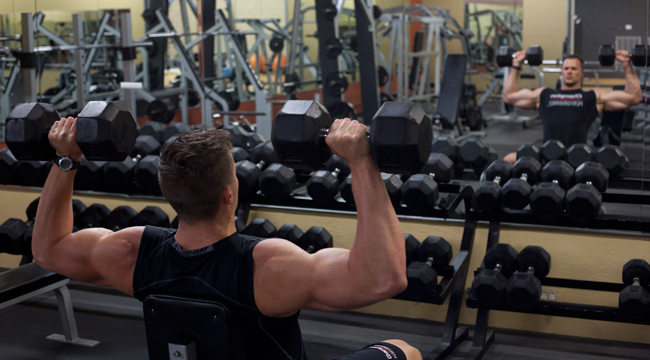 From there, you will move onto the dumbbells for some side raises to get those huge caps on the side of the delts. The machine rear delt fly machine, or reverse pec deck, can be done with heavier weight and lower reps than the rear-delt dumbbell flyes because of the predetermined range of motion. Finish up with them here completes your three-stop, delt-head tour. Perform all three exercises in a circuit fashion, moving from one exercise to the next without rest. On the overhead presses, after one warm-up set using light weight, use a weight that is about 80-85% of your 1-rep max (1RM). Rest 90 seconds between circuits. Make sure to rest at least 48-72 hours before you perform the next shoulder workout. The first workout of the week focused on moving big-boy weight to develop strength, enhance hormonal response and target as much fast-twitch muscle as possible. For this workout, we are looking to flush as much blood into the shoulders as possible and breakdown a ton of muscle fibers. The dumbbell shoulder press allows a freer range of motion than dumbbells and calls some smaller stabilizers into play. Cable lateral raises – done one arm at a time -- target your middle delts with a different type of resistance and face pulls hit your rear delts in multi-joint fashion, with your biceps and forearms playing a greater role in each rep. These exercises are performed in straight sets fashion. Finish all sets and reps for one exercise before moving to the next. Perform one light warm-up set ahead of your presses and then start at a weight that is about 65% of your 1-rep max (1RM). Add weight on each set until you reach about 80% of your 1RM. Make sure to rest at least 48-72 hours before your perform your next shoulder workout. For more training info from Justin Grinnell, CSCS, you can go to www.justingrinnell.com, or visit his gym’s website at www.mystateoffitness.com, his Facebook page, or check him out on Twitter. He is the author of The Grinnell Lifestyle: My Nutritional Doctrine, available on Amazon.